[Episcopal News Service] The Episcopal Church’s Executive Council on Jan. 24 approved a $133.7 million draft budget for the 2019-2021 triennium that is based on requiring Episcopal Church dioceses to contribute annually 15 percent of their operating income. The budget, which is essentially balanced, with a small surplus of just $2,654, is far from final. It must eventually be approved by General Convention when it meets in Austin, Texas, July 5-13. It will no doubt undergo some changes between now and then. The budget is based on an anticipated $133.7 million in revenue to pay for an equal amount in expenses. The triennial budget is up about $8.7 million from that approved by the 2015 meeting of General Convention for the current 2016-2018 triennium. The draft budget increases the money allocated for evangelism over that which was included in the most recent iteration because, in the words of House of Deputies President the Rev. Gay Clark Jennings, council heard a “clarion call” from the church to do so. Evangelism is one of the three priorities General Convention set for the church at its last meeting in 2015. The final version of council’s draft budget also includes increases in the other two priorities of racial justice and reconciliation, and creation care. Council’s Joint Standing Committee on Finances for Mission, which crafted the budget, “focused on looking at every line in this budget because it’s not only important that we talk the Jesus Movement but that we walk the Jesus Movement,” said its chair, Tess Judge. 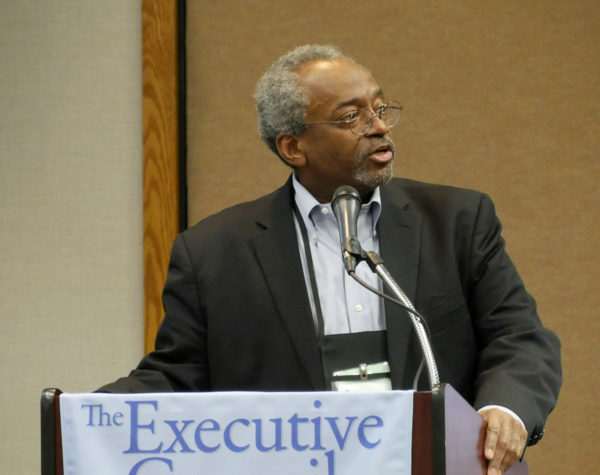 Presiding Bishop Michael Curry said during a post-meeting news conference that the budget process “reflects a community coming together, doing the hard work, seeking to keep Christ at the center.” FFM listened “deeply and seriously” to the rest of council, to the more than 200 people who responded to a survey on the budget and to the churchwide staff, he said. In the end, he said, it involved finding ways “to fund the work in the direction we believe and pray that the church is and ought to be going.” Curry said the budget reflects “a church moving forward” into the vision of the Jesus Movement that he and General Convention began articulating in 2015. The Rev. Susan Brown Snook, the council member who chairs the Joint Standing Committee on Local Ministry and Mission, which shepherds the church’s evangelism work, thanked FFM members for listening to council members and others in the church and adjusting evangelism funding. Very grateful and pleased that #ExCoun just approved a proposed budget that includes good evangelism, church planting, and congregational redevelopment funding. The Episcopal Church’s three-year budgets are funded primarily by pledges from the church’s 109 dioceses and three regional areas. Each year’s annual giving in the three-year budget is based on a diocese’s income two years earlier. In the current budget, dioceses can exempt the first $150,000 of income. Council’s draft budget drops that exemption to $140,000. The exemption was $120,000 during the 2012-2015 triennium. Not all dioceses pay the full asking for a variety of reasons. Diocesan commitments for 2016 and 2017 are here. At the 2015 meeting of General Convention, bishops and deputies turned the current voluntary diocesan budgetary asking system into a mandatory assessment, beginning with the 2019-2021 budget cycle. Dioceses may ask for full or partial waivers. Without getting a waiver, a diocese that does not pay the full assessment will be unable to get grants or loans from the Domestic and Foreign Missionary Society (the name under which the Episcopal Church is incorporated, conducts business and carries out mission). Council’s draft states that the budget would have $89.5 million in diocesan revenue if all of the church’s dioceses fully make their mandatory assessment payments. However, FFM anticipates that up to 20 dioceses will get full or partial waivers of those payments under a system that will go into effect in the 2019-2021 triennium, which could equal up to $5.9 million, according to the Rev. Mally Lloyd, the member of council’s Joint Standing Committee on Finances for Mission who led its budget work. Thus, the likely total diocesan contribution is pegged at $83.6 million. Council’s Assessment Review Committee has begun talking to dioceses that do not currently pay the full amount of the assessment or who anticipate asking for a partial or full waiver in 2019. Lloyd told council that FFM reduced the amount of anticipated assessment waivers by $1.3 million from the version of the budget it began working on at the start of this Jan. 22-24 meeting. FFM decided to reserve less than the full amount accounted for in the anticipated waivers “so that we have an impetus to push dioceses further along” by not starting from the assumption that all waivers would be granted at the amounts requested, she said. Other major sources of anticipated income include $31.7 million from a 5 percent draw on the interest earned by the church’s investments and $10.2 million in rental income at the Episcopal Church Center in Manhattan. 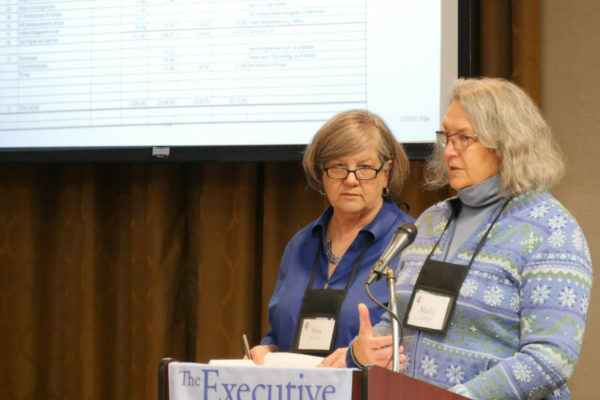 A planned annual appeal for contributions to the churchwide budget from Episcopalians is projected to raise $1 million over the three years of the budget. FFM applied the additional income it found to the budget’s expense lines. Among the larger additions to its previous version of the draft budget is $1.86 million into the line items for evangelism, including money for a new staff position. Committee members also removed an earlier request that staffers working in evangelism cut $400,000 from their 2019-2021 budget. Money was also budgeted for a new staff member each for the church’s racial justice and reconciliation work and creation care work. The budget also includes money for paying a full-time salary and benefits to the president of the House of Deputies. That position, which is filled by election during each meeting of convention, has always been unpaid. The president has a travel budget and a paid assistant. The Rev. Michael Barlowe, the secretary of General Convention, said during a post-meeting news conference that the office of House of Deputies president has evolved in recent decades along with the office of the presiding bishop. The issue of compensating that officeholder has been discussed for decades, he added, and the Task Force to Study Church Leadership and Compensation has concluded that being the president of the House of Deputies is now a full-time job. Supporters of the change say making the office a paid job would broaden the pool of people able to consider running for election. According to the joint rules of General Convention (II.10.c.ii on page 227 here), council must give its draft budget to General Convention’s Joint Standing Committee on Program, Budget and Finance (PB&F) no less than four months before the start of General Convention (essentially by February of convention year). PB&F will meet next from Feb. 5-7 to begin work on that draft budget. PB&F uses the draft budget and any legislation passed by or being considered by General Convention to create a final budget proposal. Convention legislative committees and PB&F will begin meeting in Austin, Texas, on July 3, 2018, ahead of the July 5-13 meeting of convention in the Texas capital city. There will be at least one open hearing, currently set for the evening of July 5. PB&F’s budget must be presented to a joint session of the houses of Bishops and Deputies no later than the third day before convention’s scheduled adjournment. According to the draft convention schedule, that presentation is set to take place at 10:30 p.m. CDT on July 11. 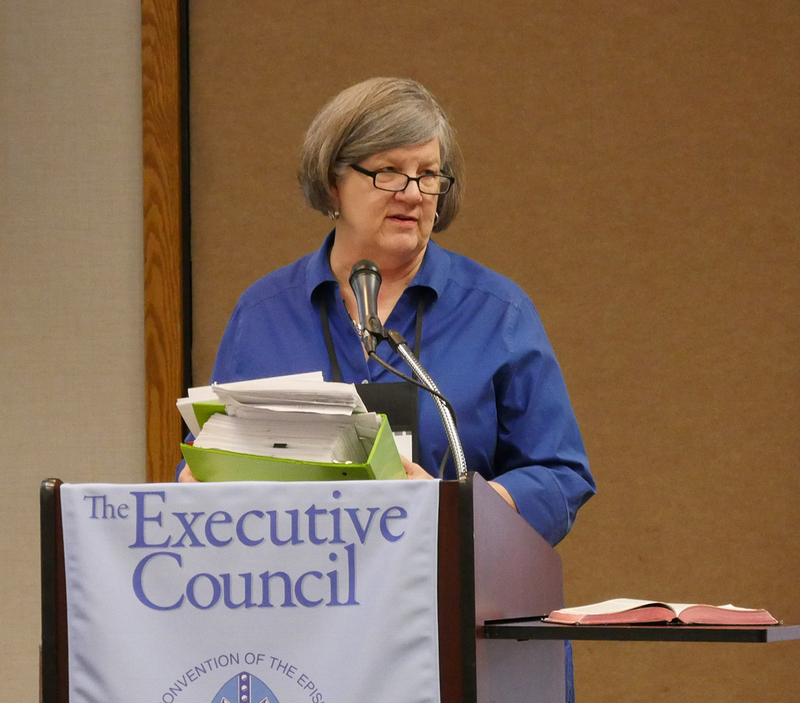 Executive Council crafts annual budgets out of the spending plan that General Convention passes as the triennial budget. Typically, council adjusts each of the three annual budgets based on changing income and expenses. The Jan 22-24 meeting took place at the Maritime Institute Conference Center in suburban Baltimore, Maryland. The Executive Council carries out the programs and policies adopted by the General Convention, according to Canon I.4 (1). The council comprises 38 members – 20 of whom (four bishops, four priests or deacons, and 12 lay people) are elected by General Convention and 18 (one clergy and one lay) by the nine provincial synods for six-year terms – plus the presiding bishop and the president of the House of Deputies. In addition, the vice president of the House of Deputies, secretary, chief operating officer, treasurer and chief financial officer have a seat and voice but no vote.